It was a night of high-fashion and festivity, aptly befitting of the celebrated group of female entrepreneurs ready to impact the world of work. 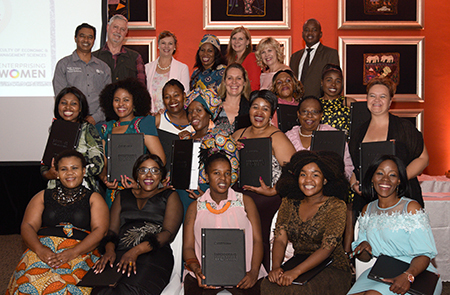 The 2018 Gala Awards of the North-West University’s (NWU’s) Enterprising Women Programme saw 28 women graduating from the programme. This gala event recently took place at the Emerald Hotel in Vanderbijlpark. In his welcoming address, Prof Herman van der Merwe, deputy dean of the Faculty of Economic and Management Sciences, applauded the women for their commitment towards the programme and acknowledged them as new role-players within their local communities. Since the inception of the programme – also referred to as EWP – the university by means of its bhive Enterprise Development Centre (bhive EDC), has skilled 95 women to become independent entrepreneurs. The programme represents a dynamic long-term collaboration between the bhive EDC and incubation and entrepreneurship development professional, Leonie Greyling from Aequis Consulting. Through this flagship programme, start-up female entrepreneurs are empowered to not only achieve their business ideals, but also to stand tall as active contributors towards the South African economy. During the past six years the programme has seen female entrepreneurs breaking new ground in numerous fields, such as: app development, catering, construction, fashion design, interior decorating as well as maintenance management. Others have developed and introduced unique products to cater for various markets. Examples include an eco-friendly mobile carwash for big corporates, the upcycling of plastic bags into designer rugs for the tourism industry and, even a taxidermy service tailor-made for the wildlife and hunting industry. 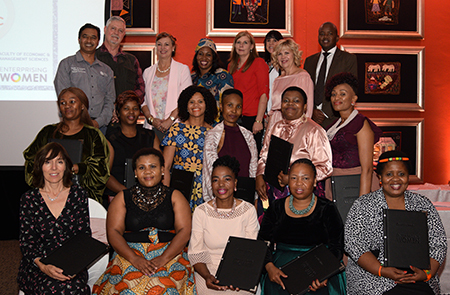 The event saw two groups of women being awarded: EWP Vanderbijlpark and EWP Sasolburg. The programme is currently also being rolled-out at the NWU’s campus in Mafikeng, while the likelihood of a group in Pretoria is being investigated.